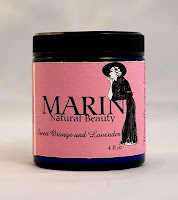 Marin Natural Beauty provides a stylish, all natural alternative to chemical–laden beauty products. By incorporating the holistic view that we are interconnected with the each other and the environment, Marin Natural Beauty incorporates sustainably grown plants, vegetables and fruit derived ingredient to produce small batches of handcrafted, all natural beauty products without harming the environment, animals or the human spirit. These vegan lotions don't contain any toxic chemicals such as parabens, sulphates or synthetics. This handcrafted, vegan delight is just what your skin is thirsty for during this cool autumn season. With Shea and Mango butter the lotion is quickly absorbed leaving you feeling soft and smooth...even on those days you don't shave. I really like this body creme. It has a sweet smell of orange and lavendar and left my skin feeling ultra soft, smoothe, silky and perfectly hydrated. I really enjoyed this product and highly recommend it for anyone, especially those who prefer a thicker body lotion. This moisturizing spray lotion is a fan favorite and now I see why. It's made from all natural products and can be used on your face, body or hands. It's perfect for any season and is portable so you can just throw it in your purse or bag and go. You can choose from a variety of scents (or you can opt for unscented). This is definitely my favorite from the line. I love that it's a light spray so you can spray it on and it won't leave you feeling heavy or sticky afterwards. I really like the sweet smell from all the essential oils, perfect for those who don't like a strong scent. I highly recommend this lotion spray for anyone, especially those who prefers a lighter lotion. To learn more, browse the entire MARIN Natural Beauty line and get yours, please visit http://www.etsy.com/shop/marinnaturalbeauty.